I’ve plucked up the courage to share this picture! I took this picture of my ptosis around a month ago. I hate myself in pictures. I am not at all photogenic and since becoming ill I am no longer Kate Moss’s body double ! (not that I ever was). 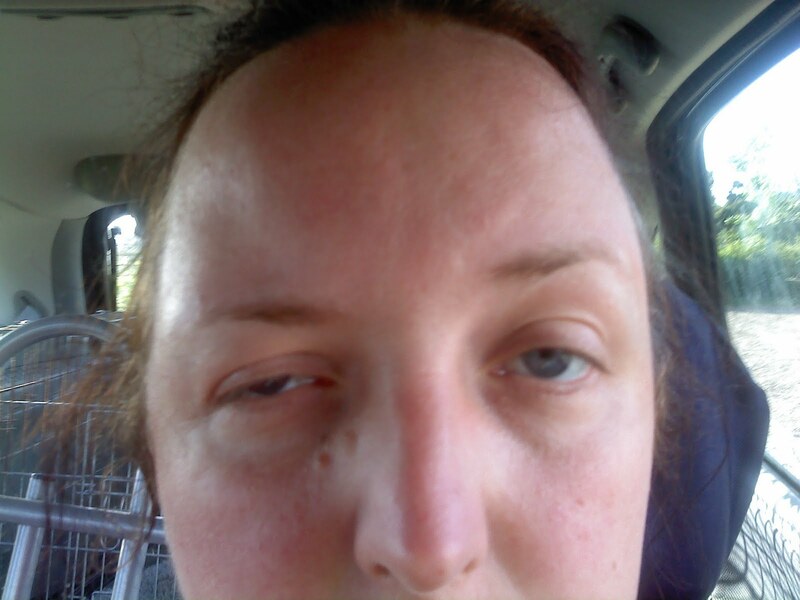 So for all of you struggling to work out what ptosis is and what it looks like here it is…. It’s not a technically brilliant photo as I had to take it myself whilst sat in the car. In this picture both eyes have ptosis just one eye is more badly effected than the other. Its not just my eyelid on the right eye that is effected as you can see the eyebrow and the right side of my face is starting to sag. To compensate and try and open my right eye you can see my left eyebrow is arched, giving me a kind of surprised look on one half of my face. However as you maybe able to see my left eyelid is also starting to droop as the lid is starting to line up half way through my pupil. Go and check out your eyelid position in the mirror and you will see the whole of your pupils not just part of it. Later that evening, well actually around 30 minutes later the left eye was completely closed leaving me blind unless I taped my eyes open. Its not comfortable to do that and although both eyes would be open my vision is completely blurred. Its like the muscles are so tired they can no longer focus to see properly. I have ptosis everyday in my right eye to some degree. By the end of the day my eyebrow starts to droop and my eyelid starts to obscure my pupil. Some days I wake up with it, most days it just develops through the day. I have a day where its completely closed at least once a week and a couple of times a month both eyes are closed due to it. When I have ptosis I have double vision and my depth perception is altered, so I can not see how near or far things are. It makes things like pouring a drink quite a challenge, or negotiating furniture a minor obstacle course! There are a few things that will make the ptosis disappear like magic. One of them is taking a drug called Pyridostigmine Bromide (mestinon) which is used in the treatment of the condition Myasthenia Gravis, an ice pack applied to my eyebrow will also make the ptosis disappear for a few minutes. This only works in the disease Myasthenia Gravis, its believed it cools the neuromuscular junction. Medical studies have proven that this is the only type of ptosis it works on and this test is used in the developing world where they do not have access to western medicine. I hate being out in public when my face looks like this and tend to hide behind dark glasses. Its bad enough that when it happens I can’t see properly but I have also been verbally abused by people who I can only describe as mentally and emotionally stunted. Some people including Dr’s think it is perfectly acceptable to make a joke out of the way my face looks when this happens. I don’t find it humorous I find it incredibly distressing and it has severely knocked my confidence. Many of you will have no concept of how hard it has been for me to post this picture, its given me a few sleepless nights contemplating the pros and cons of exposing myself in this way. But I am in this for the long haul and the point of my blog is for people to understand and you can’t understand if you only have part of the information. Hi Rachel .. thanks for sharing – can't say I'm thrilled at seeing .. but it's important for us to know. I can quite understand why you want to curl up and disappear .. somewhere I hope they can help you in some way ..
Rachel, I know how hard it must have been to post your picture. No one wants to have their picture taken when they are not at their best. I haven't been able to get a picture of my droopy face yet!! By sharing your photo it gives you the chance to educate others about MG, sometimes we need to educate our doctors as well. Rach we could be twins except my left eye doesn't droop YET! I wear glasses with a patch over one eye. So far nothing has helped my droopy eye but my last IVIG treatment helped my double vision a bit. Most comments I get on my appearance comes from small children and they just don't understand. Thanks for taking the time to read my blog and share your experiences. Kids can make comments that hurt due to them being kids. Its the rudeness of adults I can never get over. Did you know that POTS is an anagram for the first four letters of PTOS-IS? I always wished my face showed clearly what I have (my ptosis is mild) or that abnormalities in breathing muscles were clearly visible when you walked into a doctor's office. I need Mestinon to breathe. What your posts do is let me know that it wouldn't help. So thank you. Do know however, that to many people, you will (do) look like a poster child of other peoples' professional ignorance. For the jokes well, if anyone made a joke about how I looked if I looked like that, I'd tell him/her to get with the program — the doctors said it's a normal variant of human physiology and it's just a rare form of exquisite beauty. Thank you for your comments they really touched me. Thank you also for taking the time to read my blog. Its nice to know so many people are supporting my battle to be heard.